If we're going to have a productive day, getting enough sleep helps greatly. And if we want to rise early and get a good start on the day, we've got to start the night before by going to bed at a decent hour! I will be the first to say that going to bed early enough is difficult for me. It's definitely one of those "hard things" for me to work on! By nature, I am what my dad calls a night owl. If I stay up late enough, it's like I get my second wind and start waking up instead of getting sleepy! How does that work when I get up early? Well, I guess you could say that I'm a night owl that would rather be an early bird, and is trying hard towards that goal! I don't really like the getting up part, but I like having gotten up, and find that I get a lot more done when I rise early. Because I aim to get up at 6 a.m., I try to get 8 hours of sleep, and thus aim to turn off the light by 10 p.m. But, sad to say, it rarely happens. It's much more common for it to be 10:15 p.m. or 10:30 p.m. or even later! It's something I'm still working on, and I'm looking forward to hearing how each of you motivates yourself to turn off the light! So, how do you get to bed on time? I do have some suggestions, but keep in mind that I don't always follow my own advice! These are things I try to do, however. Head to bed much earlier then you actually want to turn out the light. I've found that if you lay in bed for a while reading or sit among pillows writing, you start to feel sleepy pretty quickly. Usually, that is! I've gotten in the habit of reading or writing or both before I go to sleep, and it helps me settle down. The one thing you have to be careful about is that you don't read or write too long! If you do read before bed, set yourself a time, chapter, or page limit. This can be hard to keep when you're in the midst of a real page-turner, but if you set yourself a limit, it will be easier to stop! Keep your evenings as free as possible. If you're at home most of the evening, it's easier to keep a set bedtime. With the exception of musical rehearsals (which we have to hold after fathers get off work, out of necessity) and band practice last year, I have tried to keep all my lessons and activities during the day. Most of the reason is because I so enjoy having supper with my family and then being free to spend time with them for a few hours, but a good reason is that it allows for earlier bedtimes! Though it's nice to be home in the evenings, it's not an every-day occurrence. Things come up, like concerts, babysitting jobs, or time with friends, and they're definitely good things to do! As we usually get home late from such things, however, I try to have them as the exception rather then the rule. Count the time evening activities will take. When watching a movie, for example, think about how long it will last. If it's a two-hour movie and it's 7 p.m., it's probably fine. But you wouldn't want to start the same movie at 8 p.m. unless you planned to stay up late. Try to get evening responsibilities, such as washing dishes, done sooner rather then later. Also, try not to get on the computer late into the evening, as it's easy to stay on later then you should. Can't sleep? I can relate! It usually takes me half an hour or more, or at the least, 15 minutes, to actually fall asleep after the light goes off. It's not because I'm not sleepy - usually I'm exhausted! If you have trouble getting to sleep, trying to quiet your mind and pray or meditate on Scripture. Sometimes I'm too excited about something, or a million thoughts about what I need to do the next day fly through my brain, and I just can't settle down. When that happens, sometimes it's helpful to write thoughts down so that you know you won't forget them; then, you're mind will be able to rest and not try to remember them all! If a long time goes by and I'm still wide awake, sometimes I turn the light back on and read a bit more (a boring book helps!) just to change directions of my excited or random thoughts and get sleepy! Keeping a consistent schedule as much as possible helps. If I sleep in one day, I find it harder to go to bed the next night, which makes me tired and more likely to sleep in the next day, which results in a late night the next... and it goes on. Sometimes you have no choice but to be up late, but if you try to get up at your regular time the next morning (within reason, of course!) you will find it easier to go to bed the next night. Weekends off mess me up, but I try to get back on a consistent schedule each Monday. As I've said before, I'm definitely not perfect in this area, and would like to hear from you! I really enjoyed hearing everyone's different schedules and thoughts on the morning last week, and would enjoy hearing your thoughts on nights this week1 Feel free to answer all, any, or none of the following questions. When is your normal (or ideal) bedtime? What do you do to stick to it? Do you have a routine before bed? Does it help? 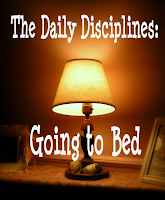 Are you consistent in your bedtime every day or just weekdays, or are you just sporadic? What prevents you from getting to bed on time? Thanks for your advice on this! I usually qualify myself as an early bird who stays up so late she ends up sleeping in. I just realized I missed quite a bit while I was gone this weekend! Here in Idaho, it is very difficult to go to bed at like, 9:30, right now. It is pretty light until 10:30 or later...and I am a night owl who is sensitive to light! Our family aims at bedtime around 10:00 now, though Friday and Saturday nights at 10:30 to 10:45. One thing that helps me fall asleep (because it takes me about a good thirty minutes at least to knock off) is pray. I focus on a couple of things....though sometimes, I fall asleep in the middle of my prayer. Thank you so much for your advice!! I have such a hard time going to bed at night!! I have so many things on my mind and get restless when I lay down at night I fall asleep later then usual!! Im going to try some of your ideas..thanks again..that really helped!! Tomorrow morning, though, I hope to start a new routine and be up at 5:30 to go for a morning run, hoping that will be a motivation to waking early! I can definitely relate to being a natural night owl with the responsibilities of an early bird. I once had a wonderful Christian woman tell me what she does when she can't sleep. She reads her Bible. She says that Satan doesn't want us to read God's word so, often she will find herself growing sleepy when she reads her Bible late at night, even if she was previously wide awake. She has the wonderful opinion that she wins either way - if she gets drowsy reading the Word, then she gets the sleep she needs, but if she can't get to sleep, then she is still improving her spiritual life. I have used this idea before, and it really does work! I really should use it more often. - When is your normal (or ideal) bedtime? Nowadays I try to go to bed before midnight but... I would like to go to bed by 10pm but for the time being it is impossible. - Do you have a routine before bed? Does it help? I can't go to bed if I haven't had a shower :) I also read every night and talk with my husband. Last thing I do is praying before I sleep. Oh, and I make sure my toes are under the blanket! When I was little my dad used to tease me and my cousins that mice will bite our toes if they are in sight. I _know_ it's not going to happen but I _still_ have to keep my toes under blanket - no matter how hot the temperature is in the room. It is easy for me to fall asleep when I want to but I am not always willing to sleep when I should and that is the thing I need to improve. I always end up doing something ostensibly important like knitting. - Are you consistent in your bedtime every day or just weekdays, or are you just sporadic? I must admit that when I have a weekend off, we usually sleep late with my husband - and go to sleep late, sometimes too late... For example on Sunday night we were watching the sunrise at 4am by the lake. I know those lazy moments will be gone if we ever are blessed with children :). So we take all the fun out of them now. - What prevents you from getting to bed on time? I have a part time job in busy kiosk (in the middle of travel center) and it is shift work. Kiosk opens at 6am and closes at 10pm. So if I am working in night shift I come home around 10:30pm and I have all those night routines to run through: walk the dogs, take a shower/have a sauna, eat, read and relax before sleep. It takes some time to settle down after meeting hundreds of people during the day. I am glad when my husband's master thesis is finally done in next month and he will go to work in turn. Then I say goodbye to night shifts and focus on my own studies. I like my job but dislike those late nights. I too am a night owl with early bird responsibilities. Lets see....my normal bedtime is usually somewhere between 10 and 11. My routine usually consists of brushing my teeth and sometimes reading either my Bible or one of my old favorite British Lit books. That is of course after watching the news with my husband if he wants. If I can't sleep I will read or focus my prayer on something specific. That usually helps quite a bit. I usually always stay up later on weekends watching movies or somthing. Thanks again for your great posts. Great tips! I'm definitely a "morning person" and took advantage of going to bed by 9 PM after my daughter was born. But, after about six months of this, my hubby, who's a "night owl" started to get upset. Now I work late evenings... ugh! So, I don't even make it to bed until after midnight!!! I am, like you, both a night owl, and an early riser. Thank goodness for alarm clocks! How do I get to bed on time...well, my bedtime is, as decided by my dear Dad, 9:30, so I try to stick to that! If it were up to me to decide my bedtime, I would try to go to sleep around 10ish, depending on my amount of energy! I like getting up early, though, too, and staying up late, so it's important I balance it...since I can't really change how early I wake up, I have to focus on bedtimes. I think the good thing to do would be to schedule your evenings(lightly).